Campus Parking: In the photo above please note the two-lane counterclockwise direction of the flow of traffic when you arrive on campus from Kingsley Road. There are two Student and Visitor Parking areas. 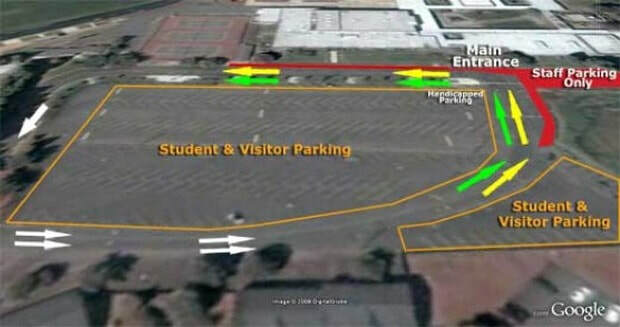 Handicapped Parking spots are available toward the school's Main Entrance in the first Student and Visitor Parking area. Red areas are No Parking zones. The green and yellow arrows indicate traffic lanes for the start and end of the school day: Yellow for student drop-off and pick-up; Green for drive-through traffic. The campus speed limit is 10 MPH. 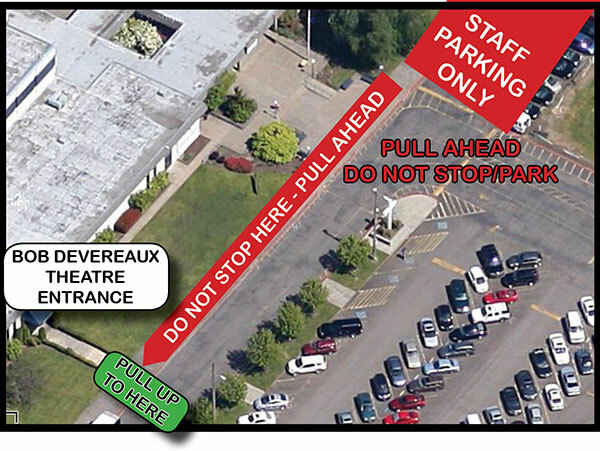 When arriving on campus (photo at left) to drop off or to pick up your student, please do not stop at the front of the school (which blocks traffic behind you). Pull ahead to the blue canopy entrance of the Bob Devereaux Theatre (near the tennis courts).